It won't hit theatres until November, but well ahead of Justice League's theatrical release, LEGO has released details for some of the first sets tied to DC Comics' next superhero-filled Avengers challenger, revealing a few of the film's baddies, and more of Batman's wonderful toys. The $20 (£15) Battle of Atlantis set, available August 1 in the US, includes a miniature archway and other architectural elements destined to be destroyed as Aquaman, a pair of Atlantean guards, and a Parademon Super Jumper minifigure battle over a mysterious Mother Box. The $50 (£37) Knightcrawler Tunnel Attack set, available August 1 in the US, includes Batman, the Flash, and a pair of winged Parademon minifigures, as well as one of those mysterious Mother Boxes again. Are we sensing a plot point yet? But the star of the show in this set is the Knightcrawler, another variation on the Batmobile that rolls along on tank treads attached to four articulated arms. Why sit in traffic when you can simply crawl around it? 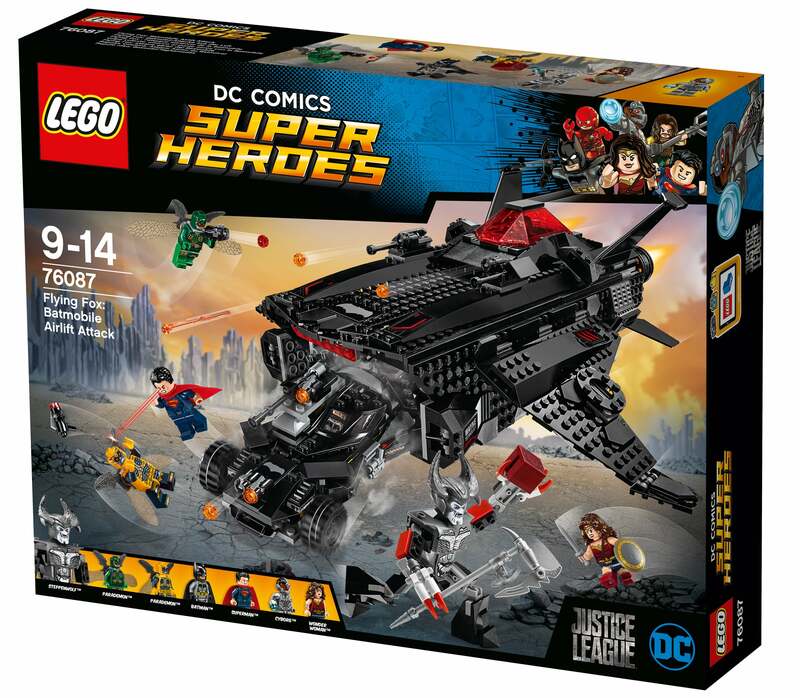 The final set, also available August 1 in the US for $130 (£98), is the Flying Fox: Batmobile Airlift Attack which LEGO could only share boxart for. This set appears to include most of the film's major players in minifigure form, including Batman, Superman, Cyborg, Wonder Woman, a pair of Parademons, and the Steppenwolf baddie. But once again it's Batman's toys that steal the spotlight in this set. The Flying Fox appears to be some kind of massive, heavily-armed drop ship that can deliver the Batmobile into battle. If you've ever wondered how Batman was able to fight crime all around the world, this explains how he can get the Batmobile from country to country. UK pricing and release dates have not yet been confirmed.